It was a sentimental night on Saturday, as members from the 2006 World Series team reunited at Busch Stadium. Out of all the members of that 2006 team, only two are still on the Cardinals. Yes, we’re talking about Adam Wainwright and Yadier Molina. The pitcher/catcher battery that closed out the World Series ten years ago, closed out the game tonight, as Wainwright pitched a complete game shutout. It was his 10th career shutout, and first complete game since 2014. Also, Albert Pujols is still active, but is on the Angels. As for the game, with two men on base in the bottom of the first inning, Matt Adams lined a shot to right field, but 2016 Home-Run Derby winner Giancarlo Stanton made an amazing diving stop that saved two runs. During the bottom of the third inning, Tommy Pham led off with a double to deep left-center field. All-Star second baseman Aledmys Diaz then walked, as Stephen Piscotty stepped up to the plate. Piscotty, one of the Cardinals’ most consistent hitters, ripped a shot to left field. Both runners scored, as St. Louis took a 2-0 lead. It was his 23rd double of the year. Randal Grichuk followed with a RBI-double of his own to make it 3-0. Also, Adams was able to hit a redemption base hit, to make it 4-0, as the Cardinals kept rolling. 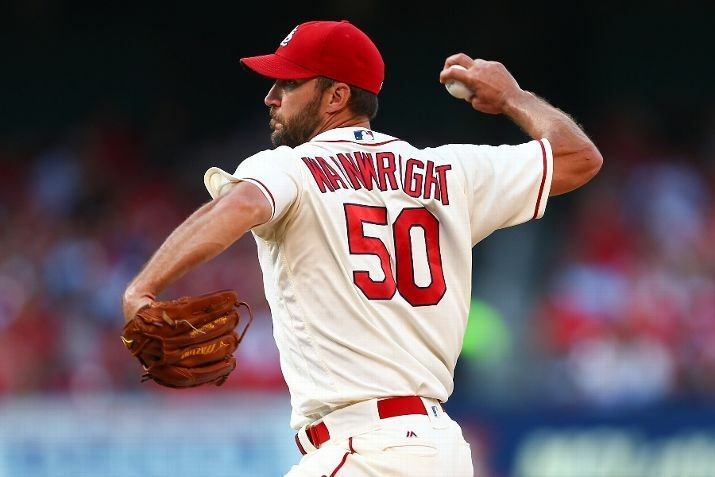 From that point on, it was all Wainwright. The 34-year old ace shut down the Marlins, while the defense (which has struggled all-year) made exceptional plays. Later, Jhonny Peralta continued to spring the offense, hitting his fifth home run of the season. It wasn’t until the sixth inning when Wainwright would allow the first Marlins’ hit. His pitch count reached past triple digits, but he remained in the game, as over 40,000+ fans, former teammates among them, watched on. And when it was all said and done, the veteran pitcher did what he does best. It’s a moment etched in Busch Stadium III history.